Next on The Scoop: What Is a Cat Abscess and How Do You Treat It? 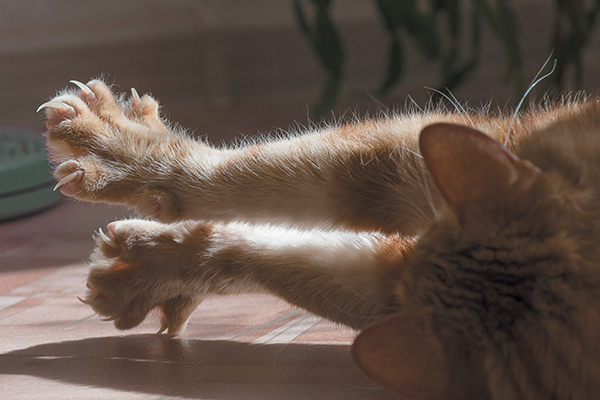 Nova Scotia is the first Canadian province to ban declawing cats. This practice is already banned in some places in the US and abroad. As of March 2018, Nova Scotia is the first Canadian province to ban declawing cats. The ban was issued by the Nova Scotia Veterinary Medical Association, which in a statement said that it considers elective and non-therapeutic declawing as ethically unacceptable. Declawing is banned in Australia, Europe and the U.K., as well as Denver and some cities in California. I’m in Japan and even not sure declawing is banned or not,because I have never thought about that.You can educate cats not to scratch walls and furnitures by using plastic cover on them (only for a while)and giving scratch post they likes. “Declaw”is much nicer word than reality,it’s “cutting finger”.You should stop it. We had best be careful about this antideclaw movement. I consider the procedure a necessary evil. I don’t think I would ever do it, but I will not rip someone for electing the surgery as long as they’ve thought long and hard about it. Here are the facts, folks. CATS NEED HOMES. CATS NEED TO BE INDOORS. CATS DONT ALWAYS SCRATCH THE CAT TREES PROVIDED FOR THEM. Think of the scenarios. Cat scratches baby. The cat is now abandoned. Cat scratches new leather couch. The cat now lives outside. Elderly people desperately want a cat but their skin is so thin… Not all cats will cooperate going to the vet/groomer to get claws trimmed every 6-8 wks. I can go on forever w/examples of forgiving declawing for the sake, in fact, the very survival of the cat. I absolutely adore cats. I think their claws are one of their many incredible features. But I love cats so much and can’t stomach all the euthanized cats, or a cat languishing in a no declaw shelter for years when kitty could’ve had a home. It is far worse for a cat to be kicked outside because of a piece of furniture. Do you know what can happen to cats? The abuse is unimaginable, certainly infinitely worse than a declaw. I have worked in the veterinary field for over 20 yrs. In my practice we have never, not once, had a problem after a declaw. It concerns me that vets are not being taught the correct way to declaw. Your choice is either get cats adopted or euthanized. As I said, IT IS EVIL, BUT A NECESSARY EVIL. I am NOT a proponent. Enlightened cat lovers and veterinarians will agree with this position. We do not need another reason to denigrate cats. We need to elevate them as the incredible companions that they are. We already have too many people turning their noses up because of litter boxes. Cats can and do live long and happy lives indoors where it is preferable for them to live. So stop being so sanctimonious and work on spay/neuter/adoption. And we must make sure that vets know what their doing because it not a routine surgery. One more thing. We’ve had cats who got horrible nail bed infections, green gunk, swelling. Declaw was the successful solution. So what? These cats are out of luck because of autoimmune or they have to go to a vet who can’t perform perfect declaws and then yes, they are mutilated. PEOPLE, think about your position. If you love cats strict antideclaw is not a good position. What can we do to have declawing banned here in the USA? I too declawed a cat many years ago I didn’t know it was an amputation! I would never do that now. I live in the U.S. and I don’t know why we’re so far behind in our thinking compared to places like Europe. I sincerely look forward to a time when declawing is banned in the United States. I never knew what declawing actually entailed. If every vet was required to tell anyone who wanted their cat declawed what actually happens, probably very few people would have it done. I had two cats declawed and never knew it was amputation. That was over 5 years ago, but now I feel badly. Declawing is wrong. If cats didn’t need them they wouldn’t have them. I could never be friends with a person who had their cat declawed, except for certain circumstances where it’s for the animals benefit. Declawing for vanity purposes is thankfully illegal in my country.